Every weekday our Goldfish Swim School has a lunch hour open swim period where member families can take a dip in pool for free. It is a nice time for parents to spend some quality time with their kids in the facility's shiver-free 90-degree pool. Everyone in the family can goof around in the water or even better the kids can practice what they learned in class showing mom, dad, grandma or grandpa the swim strokes they are mastering. This fun hour in the pool that doesn't cost any additional money to participate in. 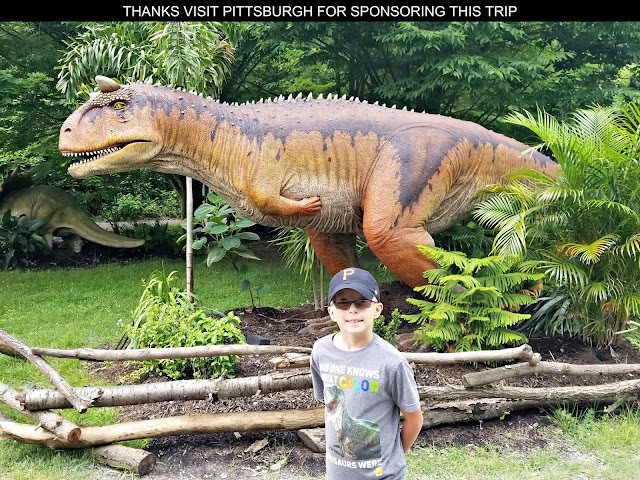 It is especially great to take advantage of when my children are on for summer break or have a day off from their elementary school classes. Once per year, Goldfish Swim School locations host a Water Safety Day carnival. During this free event, the staff provides water safety presentations, complimentary food to eat, and a variety of family-friendly activities. 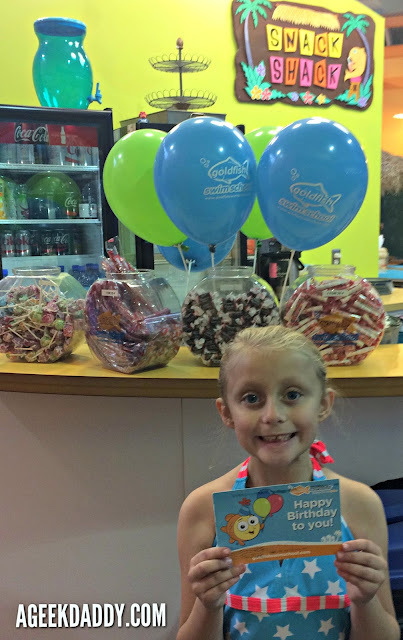 During the most recent event, our local Goldfish Swim School treated kids to face painting, a goofy photo booth, bounce houses, and balloon animals as part of the festivities. Plus there is a family open swim time going on in the main pool that is available to anyone who wants to jump in. Kids enrolled in Goldfish Swim School are sent a birthday card that they can redeem for a free treat at the Snack Shack. Being able to choose a handful of candy, a bag of popcorn or a granola bar to commemorate their special day always puts a big smile on the kids faces who are turning their birthday cards in. 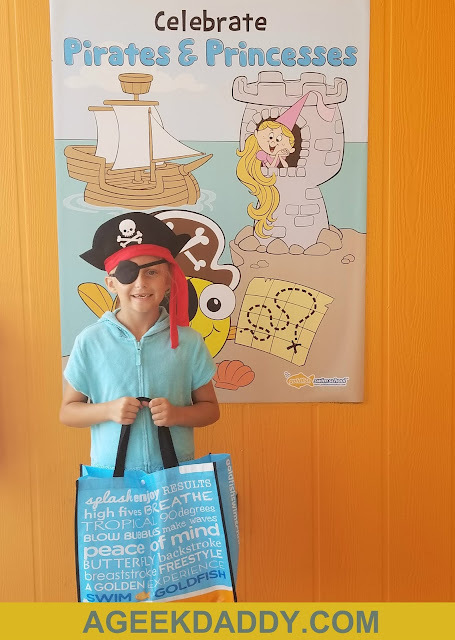 To help make lessons a bit more fun, Goldfish Swim School also has a special theme they promote each month with decorations around the facility, activities such as coloring contests, and special giveaway items they hand out each week to children after they've completed their lesson. My kids have a collection of water toys they treasure featuring Bubbles the Goldfish Swim School mascot that are given out each month based upon its theme. 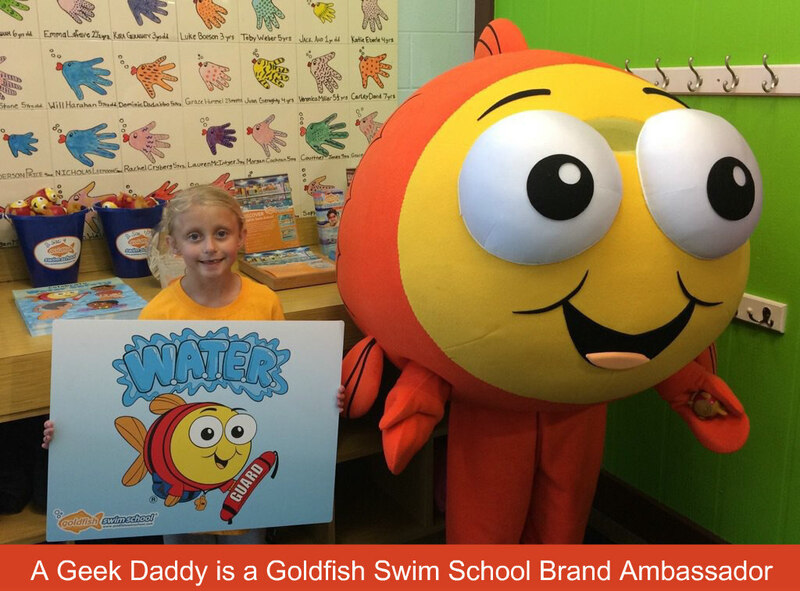 Having a different theme each month is just one of the many ways Goldfish Swim School differentiates itself as an ideal location that truly caters to providing a great experience for families who bring children to go swimming there.